A report on the media blackout on Wall Street. I just received this request today and decided to post it. It is mainly for those in Noerth America, but Codex has raised it's head over over the globe. This Codex organization is all about giving Pharma control of all drugs, vitamins and health supplements. They have misinformed and misdirected the politicians away from what is best for the citizens in their Lands. This is CODEX raising it's ugly heard again so PAY ATTENTION you lot, even here in Canada! The World Health Organisation [WHO] and Health Canada are as much under the control of the Drug industries as are the USA FDA and our Medical doctors - and I say this with respect to these doctors. This is how they have been raised and brain washed! WAKE UP humanity - Nature has provided us with what we need but we think we are better. Oh yes and don't forget your vaccination especially those ones just born - Yup - stick a needle in them and bugger their immune system! Sure - go for it - what the hell, eh? This might be the most important alert I've ever sent you. We must act now. Don't just email - call your congressional representatives if you value your health freedom! This is serious! These people are displaying unbelievable corruption and they think no one will bother to STOP THEM. 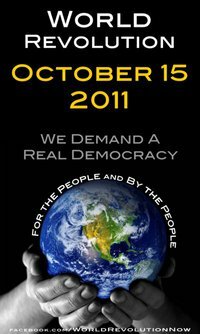 Spread the Word - Where Will You Be October 15th? And let us hope it's a peaceful one. Best wishes to all those who will be representing all of us whether we know it or not. 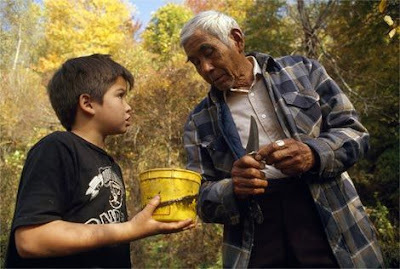 In Big Cove, North Carolina, Cherokee Indian Walker Calhoun and grandson, Patrick, collect witch hazel bark for brewing medicinal tea. Calhoun is knowledgeable in the Indian ways of medicine, dance, and language, and he teaches the practices to area schoolchildren. “Grandfather, tell me about Spirit,” said the young boy with crow-black hair. “I can! But I didn’t hear it before.” He opened his eyes. “I hear more birds singing. I hear a whitetail somewhere behind us! I hear a jack rabbit. Grandfather, I think I hear some ants crawling. That’s impossible!” The boy’s eyes flew open. Grandfather chuckled. “Nothing is impossible, grandson. Everything is connected by Spirit. We are connected to the deer, the rabbits and the ants and they are connected to us. Now, close your eyes again,” the old man said. “Grow quiet; breathe very deeply. When I touch your forehead, slowly open your eyes. Do not be surprised by what you see. This is what Spirit looks like.” When the boy quieted, Grandfather touched the boy’s forehead and he slowly opened his eyes. His jaw dropped and he looked at his grandfather. “Grandfather?” the boy asked, touching the old man’s knee. “See, over there,” he said, nodding his head. “The wood pile?” the boy asked. “Yes, grandfather,” the boy said, shaking his head. “You got me again!” They both laughed and the boy ran off. “Thank you, Great Spirit. It is time for this old man to nap,” he said. He stood up, observed his grandson for a moment, smiled and headed home. I can this 9/11 for dummies. It's worth a view. People and Planet: Sir David Attenborough Presents The 2011 RSA President's Lecture. This is an interesting lecture on the dangers facing the Earth's ecosystems along with the problem of population growth. How Can We Help The Hopi People? I am sometimes asked, “How can we help the Hopi People?” Having lived with the Hopi for a number of years, I can assure you that they do not need our help. They have been trying to help us, all four races of man, black, yellow, red, and white, from the beginning of time. 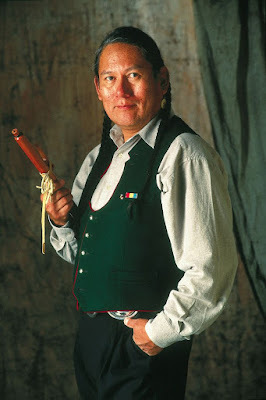 The Hopi society is not based on money, owning property or collecting things. Green fields, rain, traditional ceremonies and laughter are all that they really need. Whenever electricity, running water, heaters, televisions, automobiles, freezers, or jobs enter the villages, only problems arise. How do I pay the bills for these things? I have ceremonial obligations and crops to plant, how can I work five days a week? How can they expect me to devote all my time for money? I never needed money before, why do I need it now? These are just some of the things I have heard on the reservation. An old Hopi joke is: Before the white man came here all I did was farm, hunt, and take part in my ceremonies. Now I have to work, to make money so I can farm, hunt, and take part in my ceremonies. I have always been amazed at how eager a true Hopi is willing to fast, pray, and devote his time for the well being of all four races of man, no matter how terrible these races have treated the Hopi. It is still remembered how Kit Carson road up to an old unarmed Hopi man planting his crop and shot him in the head for no reason. We name cities, streets and mountains after Carson, and the Hopi lost one of their ceremonial leaders and had to eliminate the ceremony he was responsible for. I am sure that if the Hopi land was fertile, with running water, oil, or minerals, they would have been wiped off the face of the earth many years ago. The Guardian that told them to settle in this location knew what he was doing. The struggle to live in this high desert area runs hard and deep in every Hopi, but still they go forward and bless us all. If I had one wish, it would be that things could go back to the way they were before the Hopi children were taken from their parents and forced to go to public schools. I know this is very unrealistic and many of the progressive, new age Hopi lawyers, teachers, government workers would argue this point. But I feel the old Hopi way was the perfect educational system. No child was ever left behind. Besides the child’s real parents they had clan relatives, aunts and uncles, Kachina guardians, and the village to fall back on. Each child was taught that it was his or her’s responsibility to take care of the elderly, the young, the village and the fields. There were many avenues of love, training, and understanding for each child. All doors were open. It was the perfect system in my eyes. Art, history, astronomy, music, religion, farming, and respect for Mother Earth, a masters class for each child, a complete way of life. There is one item that the Hopi seek. The missing corner of the Fire Clan Tablet. The Guardian that I mentioned early, gave the Hopi a small stone tablet. that not only gave the Hopi permission to occupy this land, but proved that he existed. Before he gave the stone to the Hopi he broke off one corner and told them that someday in the future their true brother would return with the corner and prove their creation story. They have been waiting ever since and this is the reason they welcomed the Spaniards back in the 1600’s. Many people have seen the stone and the Hopi even took it to Washington for a meeting at the United Nations, it does exist. As global events have gone from bad to worse and mirrored the prophecies the elders had been taught one of the elders was so worried about our future that he made a replicate of what he thought the tablet would look like if the missing corner was attached. When you compare the tablets you’ll notice that Water’s left off the pyramid on the bottom right hand corner when he describe the tablet in his book. I believe he did this because he knew the controversy that might have taken place back in 1963 if it was included in his book. What could the Hopi’s have know about the Pyramids? If the missing corner of the tablet was found here in the America’s it really wouldn’t prove very much - but If the guardian took the missing corner back to his point of origin, or across the sea, than it would prove the Hopi Creation Story when it is found. How else could it have gotten across the ocean? Like I said that guardian was pretty smart. The only location where I know that a stone table has been protected for thousands of years by a guardian, is in a small town in Ethiopia, Africa, south of the pyramids, called Axum. It is housed in a small chapel called the Ark of the Covenant Church. And what ever is inside the church is guarded around the clock by a guardian 24 hours a day. No one is allowed to see the stone. Once a year, on January 18th and 19th, it is paraded around the city in what is called the Timkat Procession and this is the most important ceremony of the Ethiopian Orthodox Church. My question would be, if they had the Ark of the Covenant or a piece of the Ten Commandments why keep it a secret? Wouldn’t you want to show everyone and prove your creation story? But if you only had a small piece of the Hopi Fire Clan Tablet and instructions to wait for your long lost brother, you might keep it a secret. My friends have always told me that the Pahana (their long lost brother from across the ocean) would come from the east and have a red hat or red cloak. Could this red box contain the missing corner of the Fire Clan Tablet? I think so. This photo also reminds me of the stone statues on Easter Island. I wrote the Hopi Tribal Council six months ago and ask if I could speak to them the next time they had a meeting. No response as of yet but you have to remember, all participants of the council have been trained in public schools and don’t really want to prove the Hopi Creation Story. In my mind the only way to help the Hopi is to go to Axum, convince the Guardian protecting the stone tablet to come to America, show the Hopi the stone (this has to be done on a certain day, at a certain time, at a certain place) and then take the Guardian back to his home after the meeting. This would prove the Hopi Creation Story; give meaning to the murals and pyramids around the world, explain how global warming and our melting polar ice caps are our biggest problem, let us know where we came from and where we are going, and tell the world that all the Hopi struggles and hard work were not in vein. In 1936, Edmund Nequatewa wrote Truth of a Hopi. His wife Jean and her son Ed gave me a copy of it back in 1971. On page 50, he talked about the return of their long lost brother: Most everybody was anxious to see the Bahana come, for they were so afraid that he might not come during their lifetime and they would not be able to enjoy all the benefits that he was to bring back with him - - for the Bahana was supposed to bring great knowledge with him. These people were telling their children that the Bahana was wise and with his inventions had reached the rising sun and was coming back to them again, for they had seen the big eastern star and that was a sign and they were waiting for him. Every grandfather and grandmother was telling their children that they were growing so old that they would not see the Bahana. They would tell their grandchildren to go out in the mornings before sunrise with sacred corn-meal to ask the sun to hurry the Bahana along so that he would come soon. This illustration is from the Book of the Hopi by Frank Waters Page 30. This illustration is from my book, The Book of Truth. I was sent this video from my friend Michael in Denmark. It is truly a beautiful and artfully done video. I do not know this Moongoddess 1961 person and I am not a big fan of this Ascension business at least in the way that it is persented by many. My view is this Acension is an individual matter and a natural process in evolution and results from decisions made and hard work and has happened for many visionaries over the centuries and is nothing new under the sun. I will end with saying that I do admire Moongodess1961 for putting together such a lovely presentation of her beliefs. Well done. 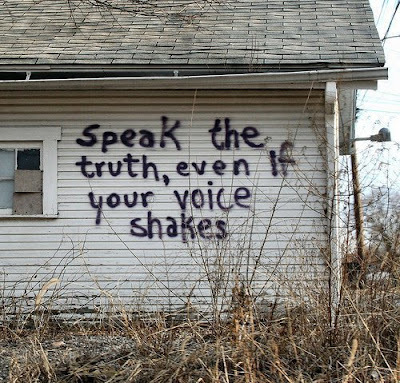 In the end it's not the words that matter but the new energies that result after the individual's transformation of one's thoughts and emotion and how this is projected out in our everyday living and our communities. Although, I am not a big Ascension fan at least in the versions being presented by many on the Net, I do find this a video with lovely images and text and well worth a watch. Rafiem created a true work of beauty. Isn't this a nice program in Kentucky? What a great idea and great tool for the people involved. I posted this message some time ago without the picture. I had this picture saved and thought that it would be a good complement to this message about the need for honesty within our human community. Shall we call it the war for drugs instead of the war on drugs? Wars for oil, wars for drugs, wars to steal wealthy Dictators money back or shall I say tax payers money stolen by Politicians under the guise of foreign aid and redirected to these countries as a form of bribes to protect and subsidize foreign companies operating in those Lands. Yes, Hycpocrisy on many levels. I released this video on my blog several months ago. A friend in Denmark sent me this updated version and I thought it worthy of a revisit due to it's new more modern form that better fits our time. Bear and Dyken Clan's latest video release on you tube. This is partly an apology to Native Americans and partly a heartfelt message from Keisha and partly a promotion of her book. My view is to listen and decide for yourself whether she is the real deal or not. Enjoy!!!!! This is truly lovely. My gift you all you dear readers of this blog. This was written in 1999. Sadly, it would seem that time has proven them right and as they suggest a strong wake up call is needed or the Human race will - like Alice- be going down the rabbit hole. So, this indeed is the 'Cleansing' time we are now in that they would seem to be referring to. "Although awakened Servers – The Children of Light – demonstrate love and kindness to all, it should be remembered that they are also bringers of destruction, for they are charged with the responsibility of clearing the weeds of ignorance from the pathways of Earth so that new growth may blossom forth. The collective force of their awesome and fiery blessings will shatter and dispel the planetary gloom that today hangs over the spirit of mankind like a burial shroud. 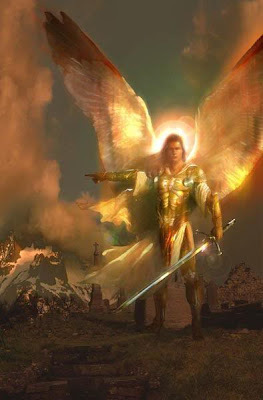 Servers “Come not to bring peace, but the sword”, and all these idealists in the world who may have built up a preconditioned holy image of the character of the typical awakened Server today – perhaps modelled upon the joy intoxicated saints of the past – may be disappointed. In fact, Servers who form the frontline of change in these times are necessarily a great deal more militant than outwardly saintly, for in order to achieve their goal they must, without reservation, charge forth to rend asunder the great veil of delusion that has been forged and maintained by evil minds and which by means of ‘vibratory imprisonment’, has prevented humanity from knowing any real freedom, peace or happiness for so long. It should obviously not be expected that the forces of darkness, having reigned upon Earth for so many ages, will surrender their dominion without great resistance. Consequently, the years that lie just ahead may appear awful and devastating to secular vision, yet seen by the eyes of the soul – which can truly see – they will be recognised to be pregnant with the power of justice and righteousness. The urgently needed cleansing of the whole planet will include a torrential inrush of light that will blind and overwhelm those who are unprepared, but will fill those who are ready with unsurpassed elation as they are glorified by the unveiled Truth. The one great enemy of Truth is self. Therefore, peril, regret, fear and dread lie ahead only for those who harbour the evil of selfishness, for mirrors line the way." It is sometimes strange how events from one's past reveal themselves from behind the veil of memory from time to time and at the most unexpected moments to remind us of where and when our current talents or abilities were shaped and forged by the encounters with those we have joined with in this life as friends, family, lovers, neighbors, classmates, work comrades, or those very special ones we call enemies who mange to capture much of our thoughts, emotion and attention. There was an event that occured while at one of the large family gatherings that were not uncommon at the home of my Great Grandmother and Great Grandfather's home. They immigrated to the United States from a small town on the sea not so far from Palermo, Sicily in the later part of the nineteenth century. Great Grandfather Giovanni was a bit of an odd ball. A very gentle and quiet man who was also a devote Catholic and stood on his head appearing to me as a yogi from India. He loved his gardening, wine making in the cellar and rolling his own cigars from whole tobacco leaves. The time setting was in the early 60s. I must have been around 6 years of age. He called me Mikey and asked me to join him that evening outside the house on a hot summer night as a line of thunder clouds approached from the west. Once outside, he said to me that I must help him to protect the home and the family from the storm. He looked at me very seriously and said that I could do this and that he would teach me to protect the family so that I could do this after he was gone from this world. If my memory serves me, he did pass away within a fews months after that evening. I have always had a sense that he had known his time on Earth was soon over and perhaps this moment in time was a gift that he gave to me that would one day be a comfort when those stormy times in our life approach. I remember following him around the house on the city walkway being a curious child and always open to the learning of new things. It was a corner city lot so we walked the length of two sides of the house. 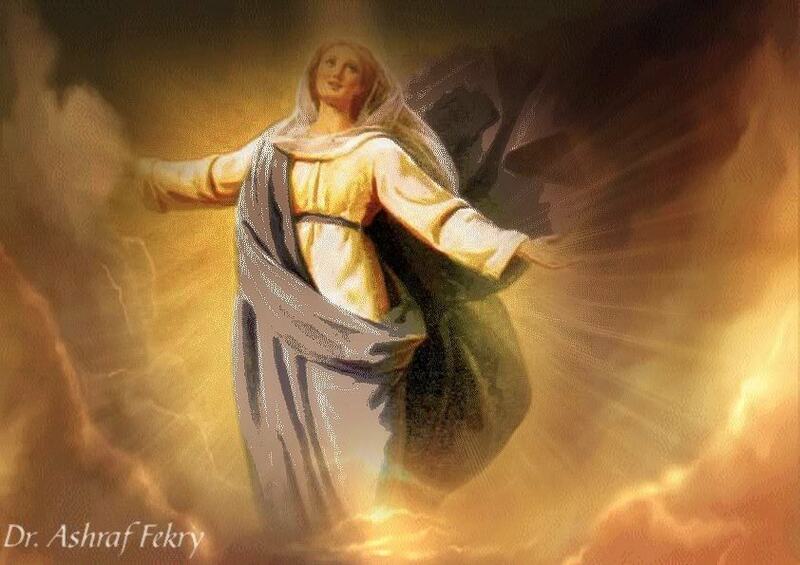 He showed me how to make the sign of the cross in the air in the direction of the storm approaching to cut the storm and said that I was to invoke the name of the Holy Virgin Mother Mary and he gave me some words that I have since forgotten. He said that the home and the family within would never be in danger if I were to do as he had just shown me. I in truth have never done this during a thunderstorm since I have always been fearless in storms and have always had the firm belief that no harm would ever come to me or to those that I love. Later in life as my healing abilities awakened and began to blossom, I have often invoked the name of Jesus or the Holy Mother, who I call, Virgin Mary, Mother of Light for those whom I know have a religious background or are firmly rooted in the Christain Faith. Whenever done, I have often later heard stories of the person in need of healing being visited by beautiful Light Beings or a beautiful woman in white who would touch them and leave them with a great sense of calm and well being. I find it strange that this memory would be popping up in my waking consciouness lately and pressing on me to write about and to share the memory of this time and this person who was dear to me with others. I have been a bit hesitant to write of something so personal and about Great Grandfather who often spoke Italian in the home and broken English to this grandchildren and great grandchildren. My intuition has more often than not served me well so I have shared this with you the readers for whatever reason that may be and so be it. Now, I have done the deed and dedicate this blog entry to the memory of Grand Grandfather Giovanni. I believe that he was a sensitive, knowing man and saw the potential in me to do good acts. As I reflect upon this event, I see him as a long line of mentors who have supported and guided me, helping me to develop talents and abilities that I would need in my future to do the tasks that I came to this Earth to do so that one day I would come into my own and hopefully be a blessing onto this world. As I reflect upon my life, I see a series of encounters with some very remarkable people, each with a lesson to teach, each with knowledge to share. So, dear readers take what you will from my narration and perhaps you too have learned something of yourself and others through the sharing of my strongest memory of my dear Great Grandfather Giovanni. A simple man of faith with a story to tell and knowledge to share, told and shared fifty years later, by his Great Grandson, Mikey. Some beautiful flute music along with some beautiful scenery. I once read if my memory serves me that flute music has longer and smoother wave lengths so is naturally relaxing to the body and emotional field. Time to accept yourself as you are and quit buying into the hype only created to control you and make you spend your currency and life energy foolishly, so that a few can live a luxery life while you suffer needlessly. Don't you think that perhaps it's time to leave the Middle Ages behind and create some new forms of human community and commerse. Now, I have had my time on the soapbox. Please do enjoy this beautiful video.